Team Korea won the International Street & Ball Hockey Federation’s first Asian Ball Hockey Championships last week in Hong Kong. Korea beat the hosts 7-3 in the final of a tournament that also saw three of their players, goalkeeper Jon Rickets and forwards Riley Horgan and John Hawkins, named to the all-star team. Team Korea defenseman Colin Gennoe said he felt the teams were well matched with a particularly tough Hong Kong. “And the team that we met and defeated in the final, we lost to them in the round robin, so it was quite a roller coaster and it was tremendous for us,” he said. There are other international tournaments in Asia, including the Mekong Cup in Thailand and Canton Cup in Hong Kong, but this was the first ISBHF-sanctioned tournament. “So it was very unprecedented and it was very exciting to see all the groups together,” said Gennoe, who is also the ISBHF’s Asian representative. He explained that the federation was mostly based in Europe and North America, and was keen to expand into Asia. Two of the federation’s board members came in from Slovakia to oversee the event. The matches were also streamed via Facebook. “I think everyone at the tournament, they were especially appreciative of the fact that people could watch the games online live. Obviously there’s a lot of family and friends of people who were in the tournament who were unable to watch it (in person),” said Gennoe. As Asia champions, Team Korea has now been invited to compete at the ISBHF world championships in the Czech Republic next June. “The team that competed in Hong Kong were primarily Americans and Canadians, but now what we are hoping to do, and what we will need to do I think, to maintain our competitiveness, is to try and garner some participation from the Korean community and get some Koreans on board with us,” said Gennoe, who explained that players must be residents of a country to compete for it under ISBHF rules. 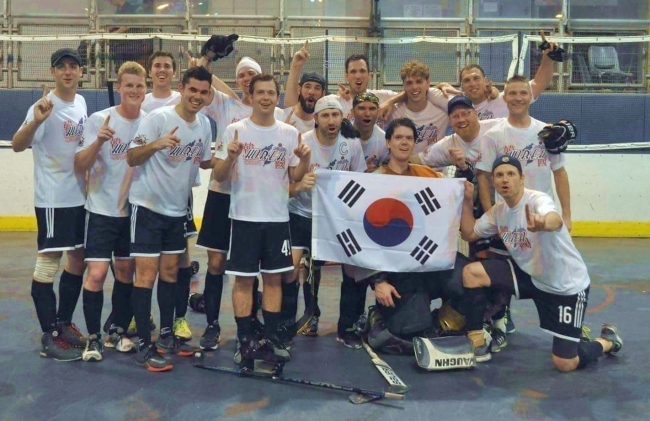 The team is selected from the best players in Canada Ball Hockey Korea, a Seoul-based league open to expats and Koreans. Gennoe said that CBHK was trying to reach out to ice hockey and in-line hockey clubs to find talented Korean players. “If we had a team made up of, let’s say 10 Koreans and 10 foreigners, there is a lot of symbolic things that are going on there, a lot of teamwork and it’s symbolic of the good-natured relationship between Koreans and foreigners,” Gennoe said.